The Third Night of Halloween: How Cuddly is a Werewolf? How many werewolves have you cuddled today? Today is the third of the Ten Nights of Halloween! We started with one little Globster lurking in the swamp, and moved on to two naughty Imps giggling in the woods. We now have three young werewolves howling in the meadow! 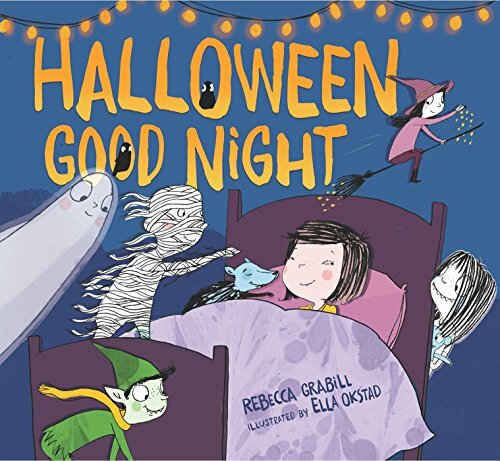 Turns out werewolves in history are not near as cuddly as Ella's adorably sweet illustrations for Halloween Good Night. I was rather alarmed by how violent and downright scary many of the werewolf myths are - not at all like the Teen Wolf of my youth! The werewolf legend is considered one of the oldest of all monster myths. Apparently tales of humans who shape shift into wolf form (called lycanthropes, which is a cool little tidbit) go all the way back to ancient Rome. In one of the first (recorded) werewolf stories, Ovid wrote around 1 AD that a powerful king (King Lycaon, origin of the word lycanthrope!) offended the gods by serving them a dinner of human flesh. Zeus then punished the king by transforming him into a wolf. Many more man-wolf stories pop up in the next 100 years. Then werewolf lore cools until about 1200 when Marie De France writes a poem about a man who must transform into a wolf every week (for no apparent reason). Werewolf lore grew and blossomed into a frenzy of hysteria during the witchcraft panic in the 1400s with many accounts of werewolf attacks. One town even had more werewolf executions than witch executions! But in coming centuries, claims or tales of lycanthropy would be dismissed as delusion, illness of the brain, or other natural causes. Only in Germany and surrounding areas did the myth persist with any real vigor. Another interesting fact: outside of Europe, were-creatures are also found in many a legend, only unlike the dominant predator of Europe (the wolf), were-creatures took other shapes. The wereleopard of Asia, the werehyena of Africa, and the weretiger of India. Beware the video below: it's a little gory (because, werewolf). You'd be surprised that most werewolf crafts are gory and adult-oriented. But after some searching, I found a couple of adorable wolfy crafts. Get your Teen Wolf on, literally with this costume tutorial. Or I guess it's supposed to be Thriller. Still, wolfish and fun! Adorable werewolf made from a pot and styrofoam ball! And other cute creatures, too. The Fifth Night of Halloween: Zombies! Welcome to the Ten Nights of Halloween! Each day I'll introduce you to one of the characters in my picture book, Halloween Good Night. Night three features the werewolf. The Second Night of Halloween: Feeling Impish? Welcome to the Ten Nights of Halloween! Each day I'll introduce you to one of the characters in my picture book, Halloween Good Night. Night two features the trick-playing Wood Imp! The First Night of Halloween: What on Earth is a Globster? !